Every day Miller Morford would wake up with a smile on his face, knowing he was the toughest boy in his neighborhood. He enjoyed scaring the other kids into giving him their pocket money: even more, he loved spending it on lollies. Rich chocolate bars, sweet sticky toffees and sugary blueberry bubblegum, which he rudely popped in people’s faces. Today Miller was feeling particularly mean, so he ate a huge breakfast, for strength to bully other kids. On his way to school he saw little Pete Greene leave his house. Pete was new on the block and Miller saw it as his right to teach him who was boss. “Hey, Peewee Pete,” Miller yelled. Pete swung around. The other kids had warned him yesterday about Miller. They told him to look out for the big bully with the dark hair and the flash orange sunglasses. He started to run. Miller dropped his school bag – full of homework he hadn’t done – and started off after little Pete, who took a sharp turn down a side alleyway, nearly tripping over someone sleeping under some newspapers. 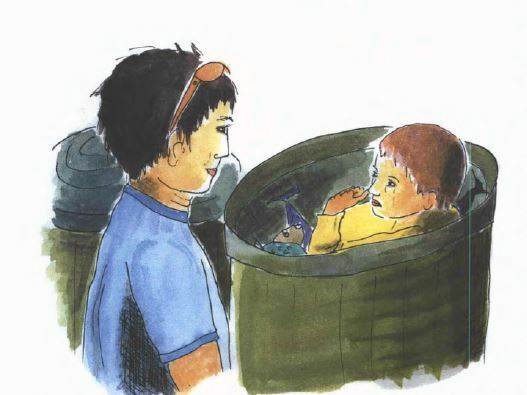 He hid himself behind a big green garbage bin. Pete huddled next to the big smelly bin, his arms cradling his legs. He felt a great sickening fear move around his stomach. The footsteps grew closer and louder; Pete could almost smell Miller’s foul breath –his teeth were going green and rotting because of all the lollies. Oh no! Pete felt a warm, discomforting trickle down his leg, a further reminder of his helplessness. Miller towered over little Pete. It excited him to know that he had frightened the small boy to the point of wetting his pants.